16" wide x 18" deep and height adjustable from 1" - 2"
Roho Seat Cushion - LTV Seat Cushion 16" x 18"
level. ROHO Shape Fitting Technology makes the difference. 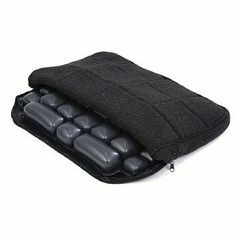 The LTV General Purpose Seat Cushion is made of individual, interconnected air cells that allow air to slowly transfer from chamber to chamber and evenly distribute body weight pressure. Weighing only one pound, the Roho LTV Seat Cushion is lightweight and easy to fold. It can easily be transported from your scooter, to the car or wherever you may need a cushion for use outside of a wheelchair. Choose from two Ultraleather covers and a wool cloth model, whichever best coordinates with your personal style. This is the last car seat, bleacher seat, plane seat, or office chair seat you will ever own. The Roho LTV Seat Cushion has an easily accessible valve that allows you to adjust the air level to one that feels best for you. General Purpose Seat Cushions are not meant to be used as everyday cushions. These are intented for short terms use; car rides or stadium seats. Mom of 4. Teacher. Long Term User. This is a fantastic cushion with the right seat underneath it. It works great at my kitchen table, which has a fairly flat wooden chair, but it's not as comfortable with my contoured desk chair or in my car. I also wish it was just an inch or two wider. I didn't think I liked this cushion very much when I first got it. It wasn't as squishy-comfy as the gel cushions and foam cushions. I was only using it as a travel cushion until last spring, when I pulled it out as a temporary stand-in while cleaning the hand-wash, line-dry cover on a gel cushion I had been using at my kitchen table. After a few days, I realized that I was sitting at the table (where I do most of my schoolwork, pay bills, check email, etc.) for much longer with less discomfort. (I have chronic sciatica. I can stand in front of a classroom all day and walk for miles, but sitting just kills me!) It's not as travel-friendly as promised. Even deflated, it takes up most of a small tote bag. It's great for taking to the kids' sporting events and school programs, or anything else that involves a hard, flat, uncomfortable bleacher-type seat. I don't deflate it--I just tuck it under my arm and go, stadium-cushion style. A handle would have been nice. I'm still trying to find the right cushion for my desk chair, so I'm going to try other inflatable cushions in different sizes and shapes. The inflatable cushions may not seem as instantly comfortable, but I discovered by chance that they work best for reducing pain and fatigue, at least for me. Lightweight. Easy Storage. Sturdy. Solid Construction. Lightweight. Easy Storage. Easy to Control. Air bladder does not feel. Limited Space. Office. Home. Car. Great product so far, but I've only been using it a couple of weeks. It's easy to adjust and feels much like a water bed - albeit slower to respond. I've been a lot more comfortable doing long hours behind the wheel - and that's what I needed. The air bladder does not feel very robust but we'll see how long it takes to have a problem. The unit does come with a patch kit, which is both convenient and disconcerting. Overall I would recommend it. NEED A CUSHION FOR A 90 YEAR OLD SITTING IN A RECLINER ALL DAY. UNABLE TO WALK. This cushion has worked very well for me! I drive bus all day around town. After several hours my bottom gets sore, but I've received good relieve since buying this cushion. Also, the cushion is very light. I would highly recommend it! I would invest in the high profile cushion for this person. The ltv is very low, only 2 inches inflated. Especially on a soft surface like a recliner, I don't think you would even get any benefit out of a thin cushion. My husband bought two of these cushions:1 for work chair and 1 for van seat. I use a high profile for my wheelchair which I love. I would suggest trying this cushion before investing in a high profile cushion. If the LTV doesn't work for her someone else could always use it. Can this be used in a go-go scooter as the orignial seat gets very uncomfortable after awhile? If you're able to get out of the chair and walk around it might be OK. I wouldn't recommend any 2" cushion for this. Even the 4" models might not be very beneficial. The stock seats on scooters such as Go-Go, Legend, and even powerchairs such as Jazzy aren't really appropriate for long-term use. I know from personal experience having developed a large pressure sore on my sacrum after only a few weeks in a Jazzy with a 2" RoHo. The rehab/powerchair specialist I was referred to by my wound doctor said that the 2" RoHo may have even made things worse. Do you ship to Canada? If not do you know who does? Is the cushon available 18x18 and what is the extra cost? Asked on Sep 13, 2012 8:20:07 PM by sarah from ca. I have a broken tailbone so traveling is quite difficult. I ordered the ltv, but thought it was too thin for a long flight. I exchanged it for a high profile cushion. I just flew from Arizona to Amsterdam and the high cushion did make quite a difference. Security questioned me that I was carrying too much, but I told them it was necessary due to a fractured tailbone and they were then fine with it. I am looking for a wheelchair seat cushion for my dad. He had a stroke and has trouble repositioning himself in the wheelchair and his current cushion is just a standard wheelchair cushion but is a good 3 inches thick. After sitting up in it for about 45 min, he often complains that his bottom is hurting. What about this Roho cushion? Would you recommend it for long time sitting? If not, is there a cushion you would recommend? We've been told Medicare will not pay for him another cushion until he has a Stage II decubitus and THAT is what we are trying to prevent! Makes no sense to me! I have this cushion and I use it every day for driving, yoga, sitting on the couch, etc, but like the other reviewer said, this is absolutely not a wheelchair cushion and should only be used for short term sitting. I agree that he should either look at a regular ROHO low or high profile cushion or a Supercor Stimulite. The advantage of the Stimulite is that it can't pop because it's not an air cushion. I don't know if this cushion was specifically made for my mom's wheelchair or not. What I do know is that her complaints about her bottom decreased after we bought this cushion. Hope this helps. I would NOT reccomend this cushion for a wheel chair. much too hard!